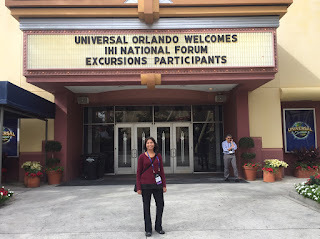 On a pleasant December morning in Florida, 200 or so clinicians and health care administrators attending the IHI National Forum disembarked a bus at Universal Orlando. At least one of them (yours truly) suffered from a longstanding and deep fear of roller coasters. What followed next was a day devoid of Doctor Doom's Fearfall or The Incredible Hulk Coaster, but nonetheless a thrill ride. These eager individuals were treated to a backstage look at how Universal Orlando keeps thrill ride junkies safe and their parents who stay on the ground taking pictures reassured - a day only a process geek could love. Universal Orlando employs about 15,000 people and welcomes anywhere between 20,000-60,000 visitors a day. Despite its high volume and complex operations, the resort has an enviable safety record, not only for its visitors but also for the hundreds of actors and stunt people it employs. The goal of our day was to identify examples of safety and reliability in a high performance non-healthcare industry that could be applied to healthcare, and to develop ideas for improving safety in own work environment. We started off the morning in a conference room learning about safety principles at Universal Orlando. Then we were whisked off to see The Eighth Voyage of Sindbad stunt show. The story-line and script were nothing to write home about, but the show’s redeeming feature was a bunch of wild stunts and the grand finale, where a stunt person is set on fire and high dives into a water-filled pit. Spoiler alert ... amidst explosive pyrotechnics, Sindbad rescues the beautiful Princess Amoura from the evil witch Miseria, and all ends well. A backstage look at the show and a Q&A session with the stunt people helped us learn how Universal Orlando designs stunts, how transitions and hand-offs occur there, what systems monitor the cast, how continuity is ensured if the cast changes, how the resort communicates changes in plan and errors, and their process for handling hazardous equipment. Reliability is the probability of a product consistently performing its expected function without failure. With about three shows a day since the early 1990’s, The Eighth Voyage of Sindbad certainly demonstrates Six Sigma level performance with very few adverse events and high reliability. In their book ‘Managing the Unexpected’, Weick and Sutcliffe describe five characteristics of high-reliability organizations (HROs) such as nuclear power plants, air traffic control, commercial aviation, and aircraft carriers. These are organizations that could have failed many times with catastrophic consequences but have not. This becomes especially important in complex, dynamic organizations that deal with uncertainty and make decisions under pressure, sometimes with inadequate information, in high-risk situations. This sure sounds like a hospital, right? Sensitivity to operations: Focus on situational awareness - constant awareness of the state of the system and processes to identify risks. Through the Job Safety Analysis process, situations are graded on a risk assessment matrix based on their level of hazard. Standardize processes to avoid variability. Design high-risk situations such as stunts to be highly reliable. Stunt people attend a fight call before each show, a brief rehearsal where they practice their moves. Reluctance to simplify interpretations: Solid root cause analysis practices when failure occurs. Safety teams review error information monthly. Use of a decision matrix to determine if an error is due to personal accountability or system problems. Entire park and each stunt is under constant video surveillance. Embrace complexity. Deference to expertise: Listen to experts at the front lines. Front line workers have firsthand knowledge of problems. Rely on knowledge, not on position. Former stunt people run the safety program at Universal Orlando. Encourage front line workers to promptly call out problems and near misses. Reward reporting - Safety Bucks are awarded to staff members who report safety hazards and these coupons can be used to buy meals at the staff grill. Meet with competitors regularly (in this case, Disney, Sea World, and Busch Gardens) to discuss and learn about safety issues. Preoccupation with failure: Focus more on failures rather than successes. Pay attention to early signs of failure such as close calls and near misses, and use these deviations to improve processes quickly. Universal Orlando has a humorous safety video, Safety Man, that all staff watch when they are hired, that stars their Chief Safety Officer in a superhero costume, tights and all. Believe that “danger is in the routine” - repetitive and familiar tasks can lead to complacency and mistakes. Commitment to resilience: Continually devote resources to corrective action plans, dealing with stress, and quickly recovering from errors. Nurture resilience. Keep the focus on learning and growing from failures. In essence, HROs foster "mindfulness" - alertness, flexibility, and adaptability. If you are headed to the Institute for Healthcare Improvement Annual National Forum this December, check out the Universal Orlando learning visit or one of their other Forum excursions.